We thank the Longwood’s Barn Quilt Trail for the invitation to tell the story of First Nation women and families during the War of 1812. 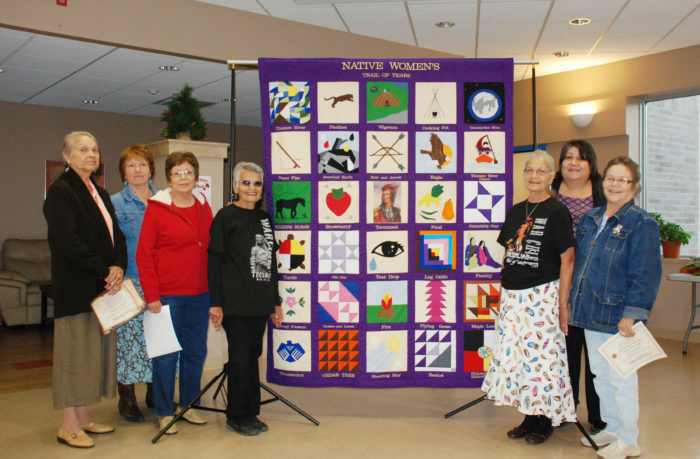 Drawing on traditional knowledge, quilters representing Anishinaabe, Haudenosaunee and Lenape nations, have created 31 beautiful quilt block designs to capture the spirit, courage and resilience of women facing incredible dangers and uncertain futures at the turn of the 19th century. See the designs copied to large 8 x8 wooden panels. Click star to the right of Trails and it will highlight yellow. This map is now saved in ‘Your Maps‘. The barn quilt trail map will hopefully be on the list and can be accessed off-line while travelling. ONA gift of maple sap was the signal of the coming of spring. It is the changing colour of the maple leaf that reminds the women of the beauty and bounty of the earth and all women. Tear Drop - There was much despair and sadness during war time for women and families. Many tears were shed over the losses during warfare. This barn quilt is located at the Mt. Elgin Residential School Memorial Site. Turtle - The turtle is one of the three original clans of the Oneida and Lenape nations. In many creation stories, the turtle plays a significant role as do women. Tecumseh - was a dynamic Shawnee leader during the War of 1812. Convincing when speaking, despite language barriers, he invoked hundreds of warriors from many nations to unite in defence of their way of life and traditional territories. Strawberry - in Ojibway means heart berry. It is considered a sacred food and the first food gifted to the people by the Creator to nourish and sustain life.